Fabric: Shelter-Rite Style 8028 Opaque PVC fabric with white fluoropolymer coating by Seaman Corporation. Fabrication and Installation: Yeadon Fabric Domes, Inc. 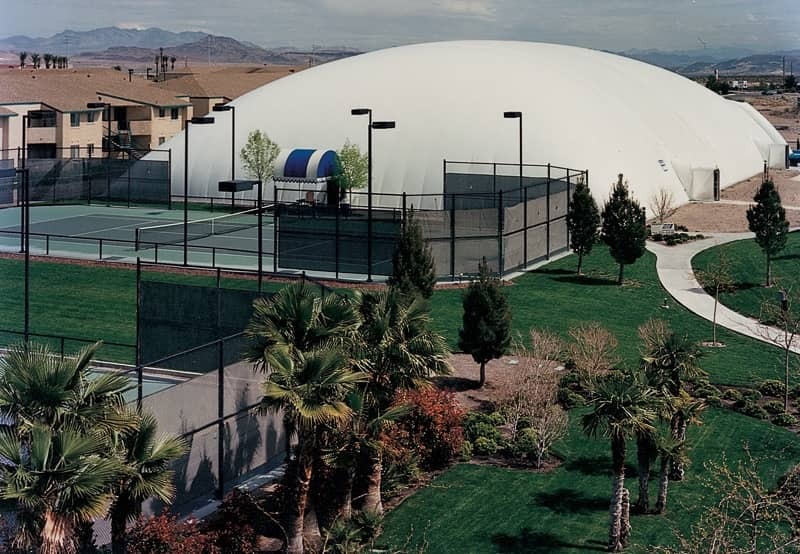 When Green Valley Athletic Club in Henderson, Nevada, set out to create a low cost, clear span, air conditioned tennis facility, an air supported structure using Shelter-Rite® architectural fabric by Seaman Corporation was able to hold down construction costs and control operational overhead. The air supported structure, which accommodates four tennis courts, was created by Yeadon Fabric Domes, Inc., a proven performer at creating economical, clear span sport structures for colleges, universities and municipalities across the country. Yeadon selected Shelter-Rite Style 8028 flame retardant architectural fabric with fluoropolymer coating for the outer skin of the structure, attaching fiberglass insulation and then adding an inner liner. The resulting architectural structure is both comfortable and energy efficient year-round with an R-12 insulation rating that works together with a sophisticated temperature control system. Built just outside Las Vegas, Nevada, the Shelter-Rite architectural fabric also resists UV damage from the blazing desert sun, while the fluoropolymer coating adds self-cleaning properties to the surface. Long life and structural durability are further assured thanks to innovations in anchoring, mechanical and electrical control systems by Yeadon.